This week, our chapter had the privilege of hearing from John Porretto, corporate communications director at Devon Energy. He is a very accomplished journalist and had a lot of wisdom to share with our chapter. John Porretto graduated from Louisiana State University with a degree in journalism. After graduating, his’s first job was writing for a local newspaper in Baton Rouge. He then moved to Mississippi to work for another newspaper, covering hurricane Katrina. Next, he worked for the Associated Press for several years and held several different positions there. He started as a business focused writer in Jackson, Mississippi, went on to be the automotive writer in Detroit, Michigan and then he became the oil and gas writer in Houston, Texas. After spending 20 years in journalism, Porretto decided that he wanted to do something different. He became interested in public relations and left the news industry. He worked for Marathon Oil as an External Communication specialist for 9 years, then moved to Oklahoma City and started as a manager for media relations at Devon Energy, before moving up to communications director. he explained that in his current position he mostly deals with media relations and the morale of the company. He also really emphasized the importance of building positive and meaningful relationships with journalists that could potentially be writing about the company you work for, and he was able to share with us several stories of how this has been beneficial to him in his career. 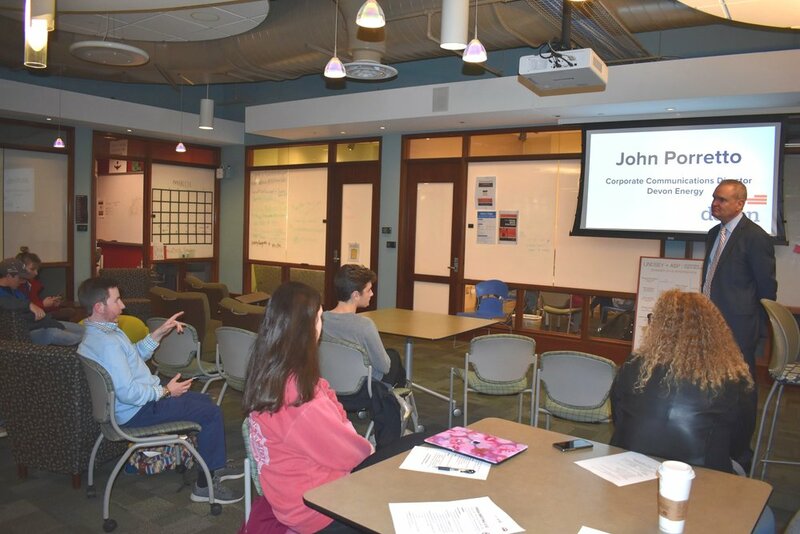 We are so thankful that we got to hear from John Porretto this week and are looking forward to our hearing from our next guest speaker after spring break.